Over the past few years, I’ve worked with a few volunteers to experiment with different methods for having productive discussions on difficult topics like politics. Our current effort is The American Townhall on Anything, a playful yet important opportunity to connect with fellow Americans for meaningful conversation. The goal for this experiment is to create “pop-up civic space” where people can have productive political discussions. This effort is similar to open source software; no one owns it, and anyone can build on it and modify it to make it work for their community. There is no official organization making this happen. These are just ideas that we hope will catch on, evolve, and adapt as they grow to have greater impact. With my dad visiting from out of town, I wanted to have some fun, meet some people, and help him get the feel for the community. I’ve been thinking about doing something like this for a few weeks now, and (finally!) I had someone who would sit there with me so I don’t look so alone. Thanks, Pops! 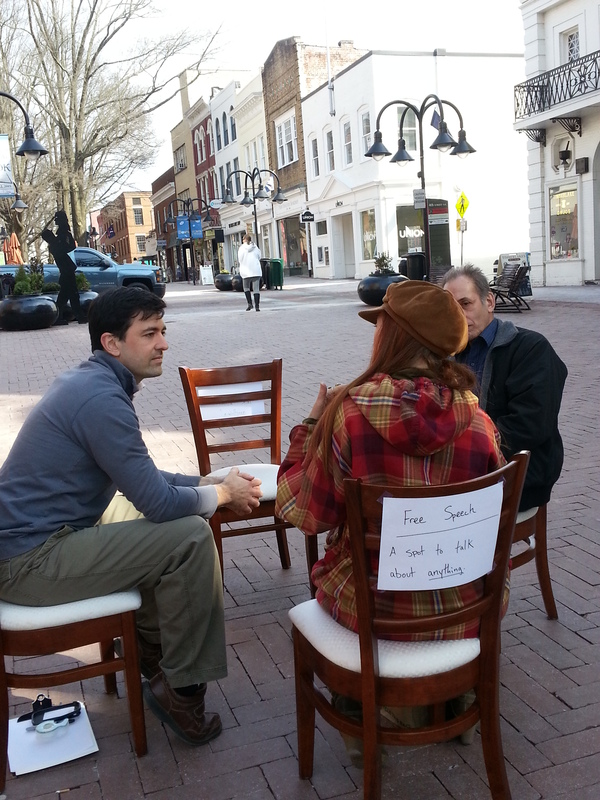 We took my four dining room chairs and walked them over to Charlottesville’s charming Downtown Pedestrian Mall. With some paper and tape I put some signs on the back of the chairs such as the one you see above. Using indoor dining room chairs wasn’t intentional (I didn’t have any other chairs), however they probably helped to catch people’s attention because they were both unusual and inviting. My father and I just started talking about topics that were important to us. 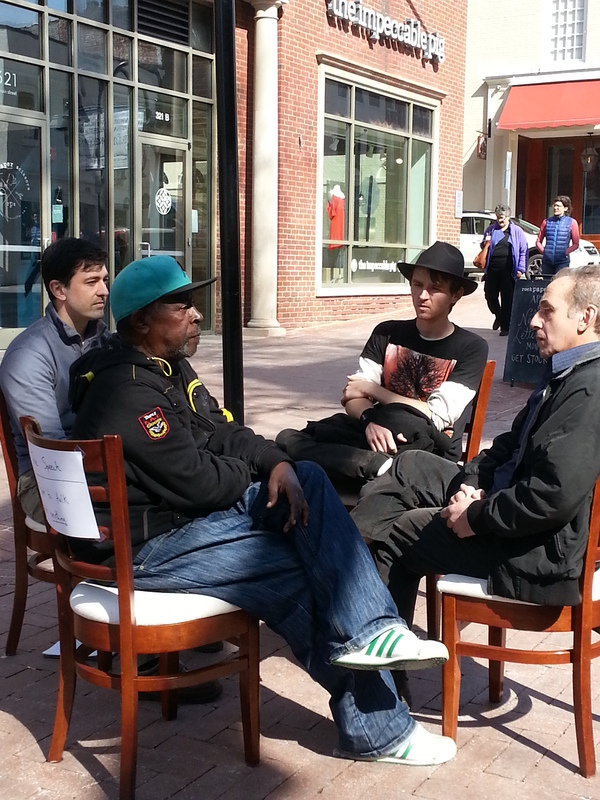 We had two open seats and people would read the signs and drop in to join us for some conversation from time to time. Over the course of two hours, we met all types of great folks with interesting stories to share. We talked about the weather. We talked about race, religion, politics, and power. We connected in some surprising and rewarding ways. One person walking by asked an intriguing question with a warm smile: “Is this performance art?” My answer: “I don’t know.” Perhaps it is, or perhaps it should be. I have to think about that. On Day 2, I wanted to kick it up a notch. I wanted to bring our traveling road show to the grounds of the University of Virginia where there has been significant racial tension over the past week due to an arrest outside a bar. We didn’t go there to talk about any specific topic. We wanted to just “open some space” and see what people wanted to talk about. This was an experiment to test how students and university staff would react to an opportunity to exercise their right to free speech. I was anxious, because I didn’t know how this would be received. After all, these are strangers sitting down to have some potentially difficult conversations. I didn’t want to create a space where someone would feel uncomfortable, misunderstood, or disrespected. Fortunately everyone felt comfortable, and we had some great conversations. We didn’t state any ground rules. People simply defaulted to being humane. Perhaps there should be ground rules. I don’t know. 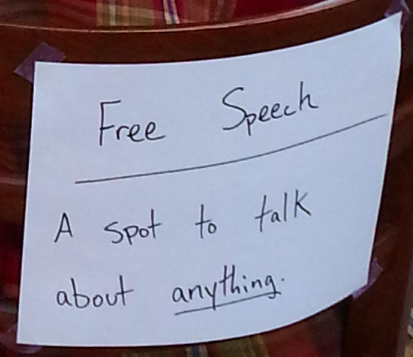 Sometimes when people would walk by, we would ask them jokingly, “Are you here for the free speech?” People got a laugh out of that. After 30 minutes, it started raining, so we packed up and went home. All in all, we were able to quickly validate our hypothesis that people would be receptive to this type of experiment on a college campus. I wanted to see whether the students would move the discussion to some difficult topics on their own, but the rain cut us short. Given what I saw today and given my experience participating in a formal student-faculty-community dialogue programs at UVA last year, I expect all participants would have dealt with difficult topics in a respectful and productive way if they came up. This was energizing and fun, and I’m not quite sure what happens next. I’m active in some online communities of dialogue facilitators, so I’m going to share this story with some friends in the National Coalition for Dialogue and Deliberation and elsewhere to see what they think. Given that the new Starbucks “Race Together” dialogue initiative has had mixed results (many people did not want dialogue forced upon them), I’d also like to (delicately) try a modified version of this inside experiment a Starbucks. If I try something in a Starbucks over the next few days, it will be very different– it would be just a sign– a silent invitation– and people can choose to sit down and join the conversation if they’d like. There is certainly a need for more productive dialogue in our country. Where do we go from here? Well, if I/you/we can create a simple, repeatable process for opening “pop-up civic space” like this, then others might do the same, and we might all surprise ourselves with what is possible. This entry was posted on March 26, 2015 at 12:48 am and is filed under Uncategorized. You can follow any responses to this entry through the RSS 2.0 feed. You can leave a response, or trackback from your own site.